Whether used in irrigation, cooling nuclear reactors, pumping wastewater, or any number of other uses, the liquid piston engine is a much more efficient, effective, and “greener” choice than many other choices available to industry. Especially if being used in conjunction with solar panels, the liquid piston engine can be extremely cost-effective and has very few, if any, downsides or unwanted side effects. As industries all over the world become more environmentally conscious, the liquid piston engine will continue growing in popularity as a better choice, and its low implementation and operational costs will be attractive to end-users in developing countries. 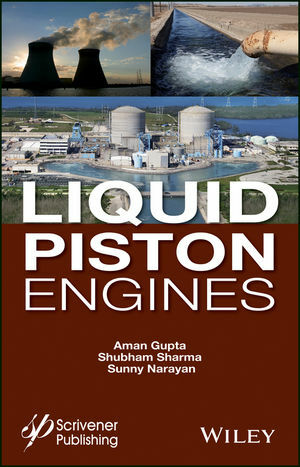 design, construction and testing of the liquid piston engine, a simple, yet elegant, device which has the ability to pump water but which can be manufactured easily without any special tooling or exotic materials and which can be powered from either combustion of organic matter or directly from solar heating. It has been tested, and the authors recommend how it might be improved upon. The underlying theory of the device is also presented and discussed. The second part deals with the performance, troubleshooting, and maintenance of the engine. This volume is the only one of its kind, a groundbreaking examination of a fascinating and environmentally friendly technology which is useful in many industrial applications. It is a must-have for any engineer, manager, or technician working with pumps or engines. Aman Gupta holds a masters degree from Punjab Technical University, and he has written or co-written several books and papers. His areas of research include heat transfer, thermal engineering, and solid mechanics. Shubham Sharma holds a masters degree from Punjab Technical University. His area of research is in mechanical engineering, and he is a consultant in the field of combustion engines. Sunny Narayan holds a masters degree from the University of Bristol in the United Kingdom and has several books and papers to his credit. He is a member of SAE, ASME and INCE and is a freelance tutor. His area of research includes combustion engines, focusing on noise and vibration aspects of engines.